Clearance - only stock on hand available. Emotive detail in-between layers of a song are often lost when you use headphones with either a dynamic or balanced armature driver. In attempt to create a more precise listening experience, we placed two drivers into one single set of headphones. This produces a sound clarity across a wider audio range. Bass and mid tones are kept mellow with a dynamic driver, perfect for bringing out the drums and bass. Yet high notes for the main melody retain rich detail with a balanced armature driver. It's time to rediscover the nuances in your favorite song, just plug in Mi In-Ear Headphones Pro. The patented balanced armature driver produces greater fidelity even for faint, high notes in a song. It has been redesigned with a higher sensitivity, better transient reponse and lower distortion for high frequency sounds. Independently researched and developed, we used high precision assembly techniques to create a lighter, more compact balanced armature driver. The drive rod is solder-attached to the driver for a studier structure and steadier sound. We also added a capacitive divider to allow the driver to operate naturally, connecting high, mid and bass notes. The balanced armature driver enhances your music's expressive power so high notes are enchantingly clear and drum beats blend better into the music. Rediscover the little details in your favorite music, like the breathing techniques of singers as they take their next breath. Voices and instruments have sounds that reside mostly in the mid and bass ranges. In order to deliver a superior sound in the mid and bass ranges, we sandwiched3 an aerospace-grade metal composite layer inbetween two PET layers. This preserves the outstanding treble responses of metal, while improving richness in the lower ranges thanks to the incredible flexibility of PET. This breakthrough design in Mi In-Ear Headphones Pro provides balanced output and superior definition across the entire frequency range. A good set of headphones bridges composers and their listeners. To produce an exceptional acoustic tuning, we used various scientific tuning and calibration methods such as the Klippel high-speed scanning vibrometer system. The Klippel system simulates recordings with a dummy head to identify the most ideal acoustics. Improvements are then made to the headphones structure based on the data received. On top of this, we also invited four-time Grammy award winning tuner, Luca Bignardi, to perform a subjective acoustic tuning for Mi In-Ear Headphones Pro. He believes a good set of headphones is one designed for the majority and bases his tuning on this belief so everyone can come to truly appreciate music. A good sound has the ability to bring out our emotions. After multiple acoustic tunings, both objective and subjective, the Mi In-Ear Heapdhones Pro has the ability to bring out expressions and nuances in your favourite song. Listen to it with a fresh perspective, and fall in love like you did at the first listen. 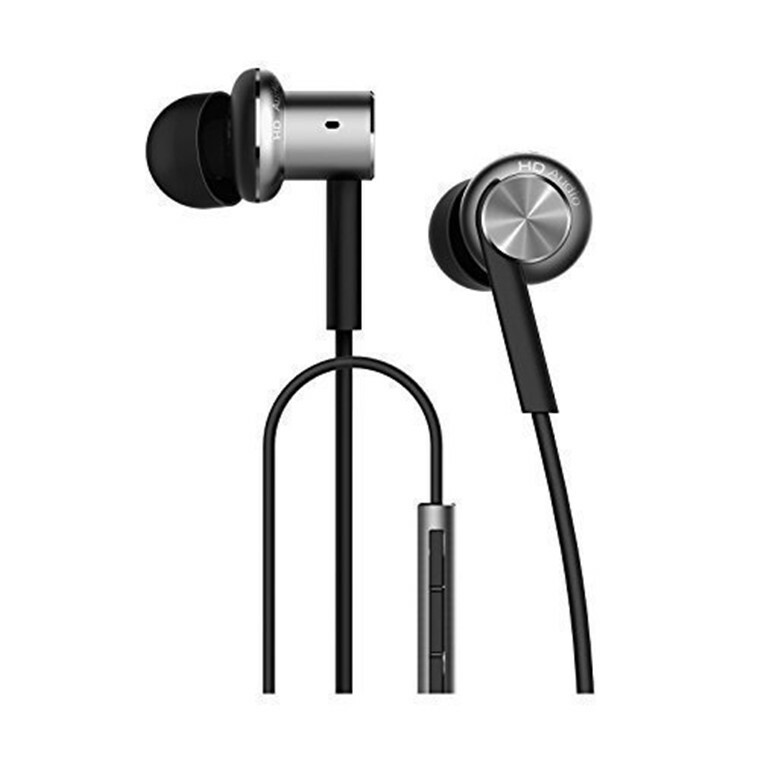 Features metallic elements like in previous Mi In-Ear Headphones. Creating the metal sound chamber is a 20-step process that involves diamond cutting, CD engraving, drawing and anodising a piece on aluminum. It is resistant to wear and discoloration even with prolonged use. Its ergonomic curves have been carefully conceptualized for utmost comfort, while looking polished and trendy. MEMS microphone reduces noise interference. Compact and small, the MEMS microphone has a 58dB(A) signal to noise ratio delivers better voice quality and lesser noise interference even when located further from your mouth. The wired remote comes with three sleek buttons for answering calls, music playback and volume adjustment. Volume buttons not supported on iOS devices. Strong, break-resistant DuPont™ Kevlar® fibers protect wiring and extend its lifespan, while braided sleeving prevents tangling. The end sections are sheathed in TPE to reduce friction with clothing, preventing an annoying "stethoscope effect" or noise interference. Headphones should always be comfortable even when worn for long periods. We've included 3 different ear bud sizes (XS/S/L) so that you can find the perfect fit. High quality silicone is used to prevent skin irritation. The perfect fit is one that closes off the ear canal to environmental noise. The ear buds rest delicately on your ear, and your skin should not come into contact with the cold metal piece. Mi In-Ear Headphones Pro has been so perfectly crafted and angled for comfort, you might even forget that you're wearing them. Far surpassing industry standards, Mi In-Ear Headphones Pro has been rigorously tested in over 700 reliability tests. It has been subjected to vibration, heat and loading tests that simulate real-life scenarios, as well as extreme high and low temperature tests, to guarantee its performance and excellent durability.